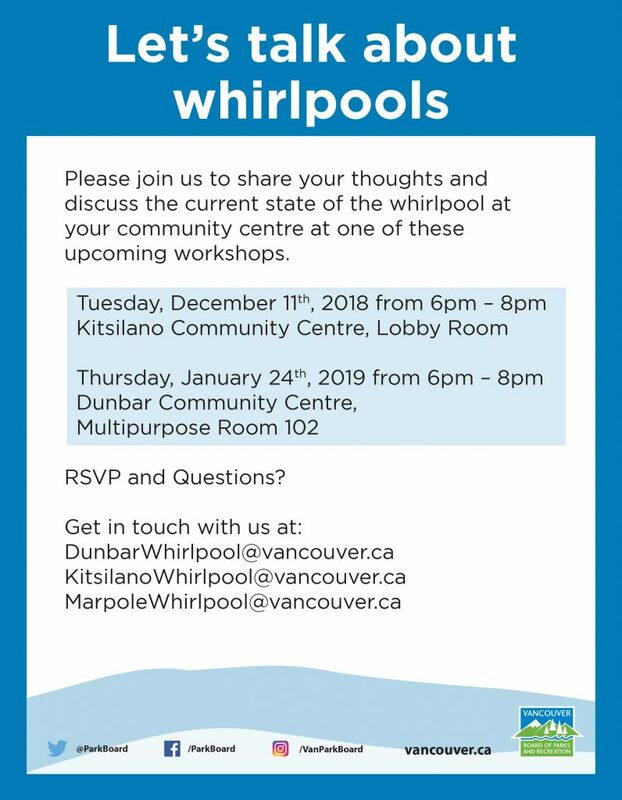 Please join us to share your thoughts and discuss the current state of the whirlpool at your community centre at one of these upcoming workshops. I hear about whirlpool closures and a possible all out closure of the Lord Byng pool. That’s a shame those whirpools are a big part for me in regards of relaxation and destressing. The Lord Byng pool is a great natural light pool in a nice location. Please don’t close. A community centre with a whirlpool is a big draw for me, and the closures would mean I’d have to travel farther to access one, and would exercise less frequently, because the overall outing would be more time consuming. As people age, caring for their health takes more time, and adding to this burden by making whirlpools less accessible can only mean a decrease in quality of life.